Mercedes' latest super car is the SLS AMG. Drawing on their heritage, Mercedes-Benz designers have created a car with gull wing doors evoking the classic 300SL of the 50s. The styling of the SLS is unique in other ways. It has a long straight hood with the greenhouse near the rear of the car and a short stubby trunk. The two passenger interior is tight on room, but includes bubbles in the ceiling to accommodate taller drivers. The SLS AMG is powered by a hand-built 6.2l V8 engine rated at 583-bhp. A seven-speed dual clutch transmission is the only available transmission. With a starting price of under $200,000, the flagship SLS AMG has a modest price tag considering the asking price of other cars in the segment and in Mercedes' own product range. 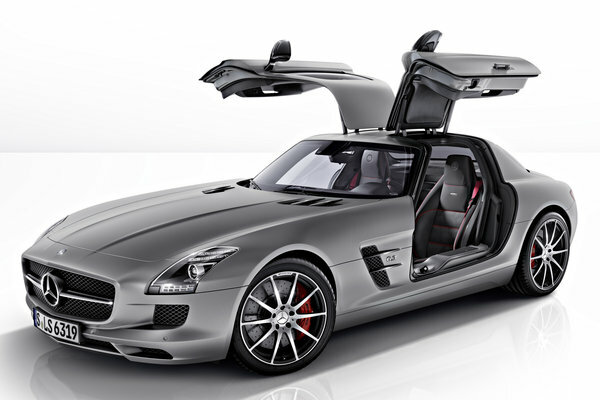 The SLS AMG is updated with more power (+20-bhp), a re-calibrated transmission and an updated suspension. The model is renamed SLS AMG GT.